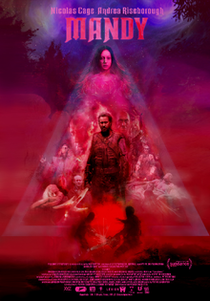 It goes without saying that Mandy will divide audiences, since it's arthouse style won't appeal to mass audiences, however, it does feature Nicolas Cage's best acting performance in a decade, and for me, that makes it worth watching for alone. The plot has been done hundreds of times before. In fact, it's practically identical to the first Mad Max (1979), relocated to the rural surroundings of an idyllic countryside. Nicolas Cage plays Red, a forest worker who lives in lakeside cabin with his girlfriend, Mandy. Their peaceful life is interrupted by a Manson-type cult who brutally murder Mandy and leave Red for dead. He survives from his injuries and vows revenge on those who wronged him, tracking them down and enacting vengeance. What could have been derivative, run-of-the-mill and cliché-ridden is given much freshness by Panos Cosmatos' directorial style, which presents the film as though it were laced with LSD throughout, complete with tinted, dark cinematography and a haunting score from Johann Johannsson (the composer's last work before his death). I think it's fair to say that you'll know whether or not you'll like this movie from the screengrab below.